The City of Safranbolu is an example of a typical Ottoman trade town. It has played a key role in the caravan trade on the main route between Europe and the Orient. The Old Town preserves many old buildings, with 1008 registered historical artifacts. These are: 1 private museum, 25 mosques, 5 tombs, 8 historical fountains, 5 Turkish baths, 3 caravanserais, 1 historical clock tower, 1 sundial and hundreds of houses and mansions. Also there are mounds of ancient settlements, rock tombs and historical bridges. The Old Town is situated in a deep ravine in a fairly dry area in the rain shadow of the mountains. The name of the town derives from saffron, since Safranbolu was a trading place and a center for growing saffron. August 2008. 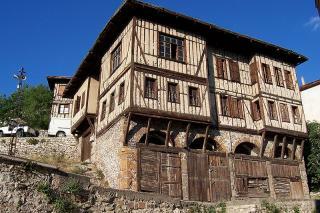 Safranbolu is a lovely old town stuffed with the beautiful wood frame houses built by the merchants. Some of these are open as museum houses, others have been turned into guest houses - some well, others not. Very relaxing to wander round the narrow lanes of the old town, scramble up to the castle and clock tower for a panoramic view, take a tour of some surrounding areas to take in the caves, the ancient aquaduct. Doesn't feel over-run by tourists. Built in the 14th century: The surviving Old Mosque, Old Bath and Süleyman Pasha Medrese were built in 1322. The caravan trade reached its apogee in the 17th century and the city also holds many constructions from that period.